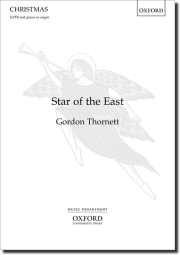 Thornett's setting of this Epiphany text, also known as 'Brightest and best', makes effective use of arching melodies and a variety of choral textures. The piece builds to a dramatic final verse with a soprano/tenor descant, before a gentle ending. The accompaniment features bell effects and quotations of Gruber's famous 'Silent night' melody. For choirs who are low on male numbers, there are options for omitting tenor and bass divisi parts.